This little Fry's ad caused a little ruckus among my electrical engineer co-workers. First a 1.5 Farad capacitor! That is just huge. 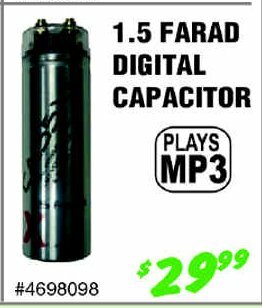 Most capacitors are in the microfarads (millionths of a farad). From what I understand these large capacitors are used for the soul purpose of ensuring that your car stereo provided maximum pain to ear drums all drivers around you. Second exactly how can a capacitor be digital? A capacitor is a analog device.. there is no doubt about it (link: how capacitors work). There is no such thing as a digital capacitor right? It turns out term "digital" refers to a built-in digital voltmeter on the analog capacitor. Ok, so I guess this ad is not so strange after all... I mean we all have MP3 playing capacitors laying around our workshops don't we?